Have you heard of the You Huak Sembawang White Bee Hoon? I’m sure many of us did, and for those who have yet to hear about it, it’s a seafood stir fry bee hoon in white gravy found at Sembawang area. 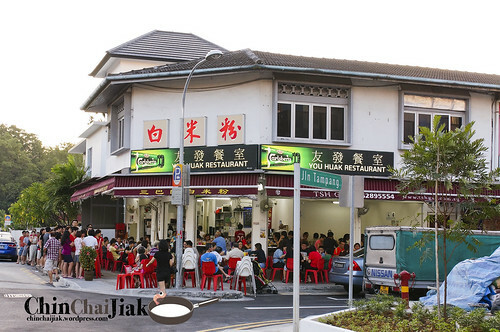 This coffee shop is only occupied by two stalls, the drink stall, and the Cze Char stall that sells various Cze Char dishes, including the infamous white bee hoon. There’s a big signage 白米粉 and can’t be missed. Expect crowd during meal hours therefore the best time to visit is probably late afternoon. I went on a Sun evening at 7pm. Wrong move. The length of the queue is rather scary but since I’m already there, so ya, i’ll take part in Singaporean’s favourite hobby – queuing up for stuff. A large white bee hoon cost $12.00 and they are rather generous with the serving. A large portion is good enough to be shared among 4 pax (if you ordered a few side dishes to go with it). 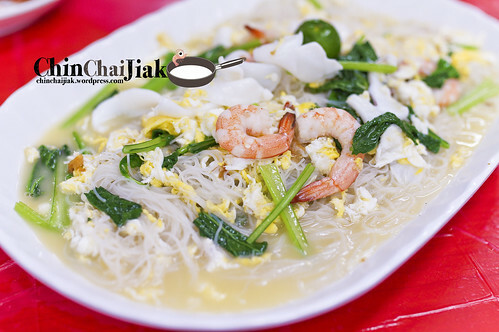 I thought this white bee hoon actually taste similar to our Hokkien fried prawn noodle. The bee hoon is soaked in the rich but not overpowering stock and it’s rather light on the stomach that enable one to savor the bee hoon without getting sick of it. I thought this is nice, but not to the extend that i’ll specially make my way down and wait for another 45 minutes for a seat. If the waiting time in only 10 minutes and if I stay nearby, then yes, I probably will visit regularly. For a very reasonable price of $4.50, it is pretty ideal as an everyday food. In fact, I thought the chilli is pretty good. It’s much more spicier and sour than most of the belacan that it greatly stimulate one’s appetite. I also love the generous amount of eggs scattered into the bee hoon. This dish is apparently one of the must-order and is one of their specialities. I think the main difference between this and other prawn roll is the texture. Generally Prawn Roll has a minced meat texture which i can chew on the meat fiber. You Huak’s meat fillings are grinded really fine (or I think they mixed in portions of fish paste) that made the prawn roll taste more compact and solid. It comes with a sweet chilli sauce dip than the usual brown sauce. 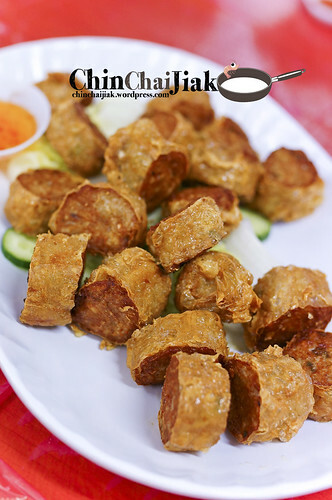 The ingredient taste very fresh, and the freshly fried crispy Prawn Roll skin adds on an additional crunch to It. I personally prefers a more meaty kind of texture so I shall say that this is more of a can-order rather than a must-order. It is not difficult to get similar quality elsewhere. 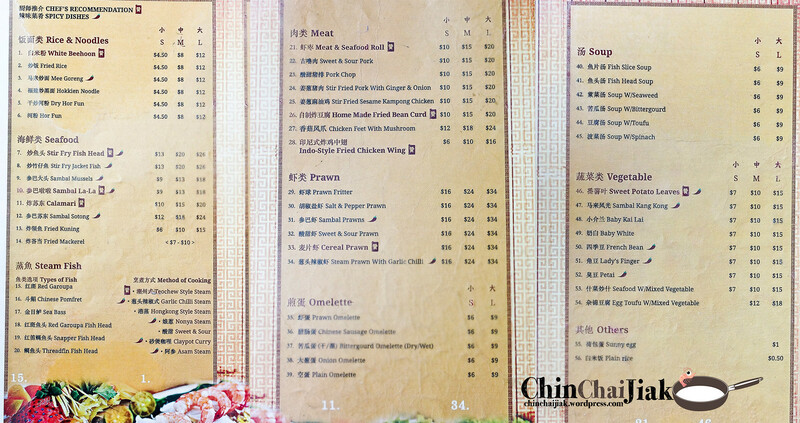 This dish is recommended by the stall auntie. When my friend asked if it’s prawn paste chicken, the auntie was evidently displease and said ‘We don’t serve prawn paste chicken here. Our chicken is indo style fried chicken’. The marinade mainly tasted like a blend of turmeric powder and thinly sliced ginger. It taste very similar to some of our malay friend’s fried chicken. The good? It’s crispy. But on the other hand, it’s rather dry. 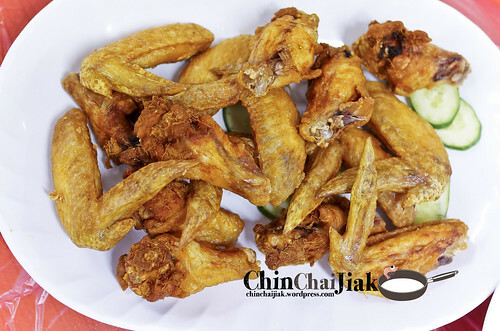 I believe mainly it’s because the wings were sent into the frying wok without a layer of breading and the wings turned dry after an extended duration of frying. I think most Singaporeans will think that it’s dry as we are very used to the breaded and juicy version. Yeap. Another fried dish. 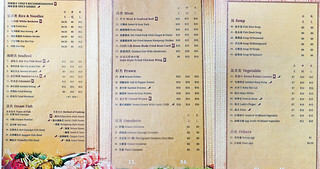 Those dishes that are labelled as signature dishes in the menu are mostly fried. Sinful sinful sinful. 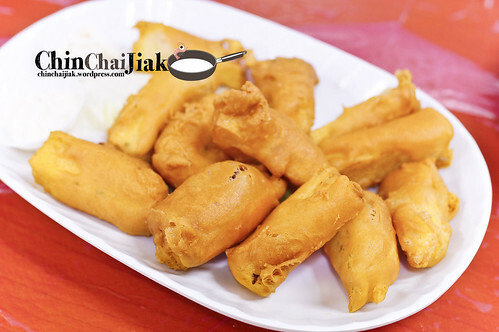 The exterior crust is really crispy, similar to the crust of a goreng pisang (fried banana fritters) and the interior is made up of tofu paste that is soft and texture is somewhat like Dao Gua (pressed tofu) with fillings. I thought this dish is a little more unique compared to the prawn roll and chicken wing. It comes with mayonnaise dips. 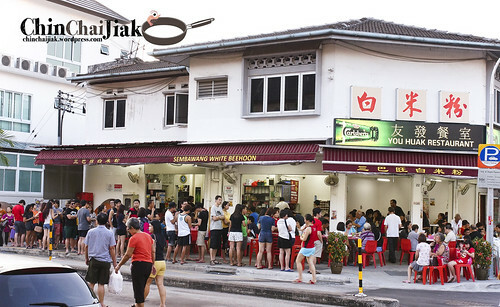 One can already judge the popularity of white bee hoon by looking at the crowd during meal hour. Everyone is queuing up patiently like it’s already the norm to wait for it’s good food. For myself, I thought it is a at-least-try-once place but i foresee that i will not return within the next couple of weeks or even months. i think similar craving can be curbed by having some really good fried hokkien mee actually. The location is the main reason that deters people from frequent visits, especially for friends who don’t drive. If I’m coming back, I will definitely visit during a non meal time and I’m sure this meal will be much more enjoyable experience. 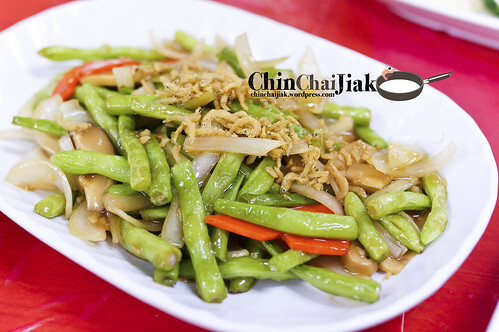 They ran out of Kailan, Nai Bai so i ordered the French Beans instead and it was surprisingly good.